Couldn't be happier with the results of my purchase. The staff was great, very easy going. i did not feel pressured at all! Keep up the great work, as i will be referring anyone in search of a vehicle to your location. Thank you frank motorcars! VERY NICE PEOPLE! The staff here are just wonderful people. Tia helped me finance my first car and she was a lot of help. The store was very clean. All the cars were well kept. I definitely recommend this place to anyone who's looking for a car! Joe and Camilo are great guys to work with. Made sure I was happy with the purchase and worked really hard to get me approved for a loan. My 2009 Chevy Colorado was an AWESOME purchase from Franks Motorcars. Great experence overall. Truck is good on gas, runs great and clean. Helpful staff! This is a great car dealer that I would recommend to anyone who needs to buy a "good" car with "good"price!! I recently bought a 2007 BMW from them and I'm very happy with it.Also great employee and customer service!! Excellent service great staff they made me feel right at home. Am more than satisfied with my purchase.. I had the pleasure of being assisted by a gentlemen named Kelly. He was upfront honest extremely helpful and informative in helping me find a car for my son. He went out of his way to accommodate me in purchasing the car I wanted and would use him again in the future and I would highly recommend his services to my friends and family. Thank you Kelly I am so happy and so is my son with his new car !!! 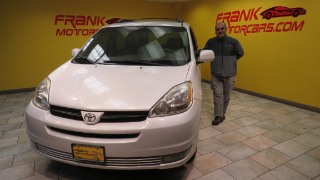 Tell us about your experience at Frank Motorcars.